I am owed money! After being invited to last night’s previously vague Aveda men’s launch, I’d cunningly deduced that they’d finally be launching the phenomenon that is Aveda Invati, but this time for men and they did not disappoint. I was delighted to be seated next to Darren Potter, the charismatic, pragmatic and very passionate general manager of the Aveda who shared so much incredible background to the product and the Aveda brand. Now, you’d be forgiven for thinking this was just the same product packaged into black and the word ‘men’ slapped on it, but on this very rare occasion you’d be wrong (I bluntly asked at the dinner). This has been completely reformulated with not just an incredible new ayurvedic fragrance but a formulation that is more suited to men’s thicker hair and tougher scalps. The conditioner has been eliminated completely as Aveda believe this provides plenty moisture for shorter hair without needing to condition (also only 1 in 10 of us guys actually condition). The new treatment is completely different to the original and does not run down your face either as it’s a delicious gel. The treatment is applied in three-lines directly onto the scalp after washing and sinks right in without a trace. The feature ingredient Amla then immediately thickens hair whilst other ingredients get to work unblocking pores and strengthening hair at the root; so less breakage. Finally the treatment only needs to be applied to the scalp once a day, rather than twice as with the original Invati treatment spray. So there you have it guys, we finally have a naturally-based hair loss alternative and this is one that really works. I can tell you this without even using the products yet from being a die-hard fan of the original Invati range (I am never without the gallon salon sizes in my bathroom). I hate to have to tell you this but it won’t be available until May but it’s going to be abso-bloody-lutely worth the wait. The shampoo will be priced at £25.50 and the thickening treatment £45. If one of you absolutely can’t cope until then, I’ll see what I can do but no promises. This is going to be a huge launch, as Invati has been one of the Aveda brand’s biggest EVER lines and for only 3 products, occupies a large chunk of the brand’s business percentage. 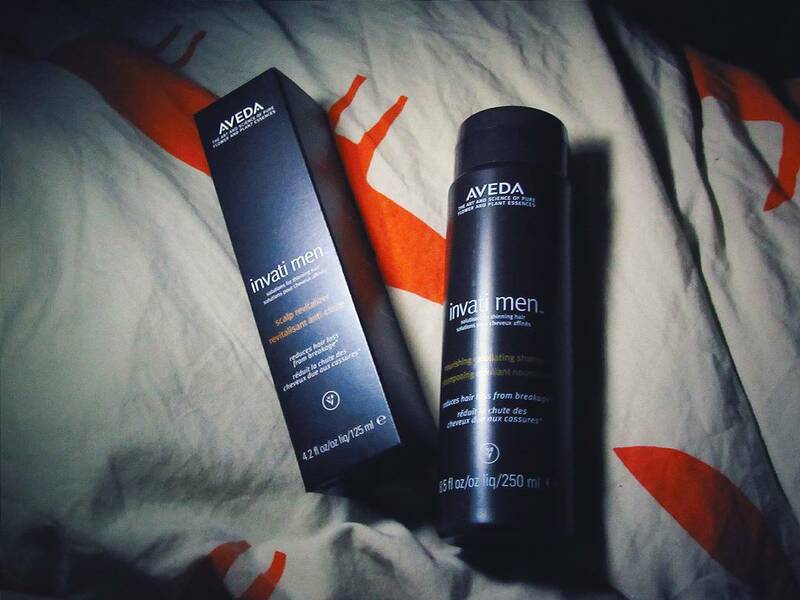 I shall be using Aveda Invati Men between now and the launch then will feedback what I’ve found! This article first appeared on MANFACE written by Thom Watson. It was published on Saturday 2nd April 2016 and was last updated on Monday 3rd April 2017 at 1:04pm. It's categorised under Aveda, Editorials, Shampoo, Treatment where you'll find more related content. This is already available in the US and I just started using it. So far I really like it. The shampoo is very conditioning, and the treatment is so much better than the original. It feels similar to their recent thickening tonic. Ooooh, definitely going to have swing by the Aveda store and pick some of this up. My scalp could definitely use some love.